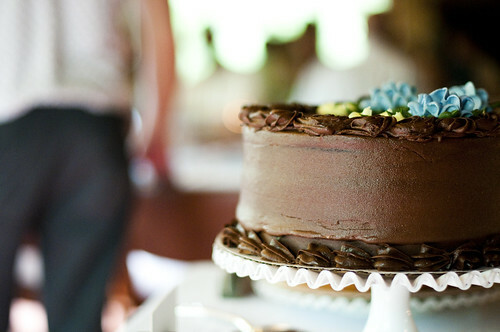 vintage cake stand, originally uploaded by ordinarymoment. We got our amazingly delicious cakes from the Country Rose Bakery. There were too many yummy flavors to choose from so we opted for four or five smaller cakes…boston creme, danish layer, strawberry creme, heavenly triple chocolate…wish I would have remembered what they all tasted like! Weddings fly by like that. I was lucky enough to round up vintage milk glass cake stands to display these treats on. We displayed them all on the bride + groom table as decoration. Makes me hungry again!